What causes the problems for catalytic converters and diesel particulate filters? The catalytic converter (cat) fitted to an engine is there to take the harmful chemicals created in the combustion process and turn them into harmless ones. Through the life of a car carbon deposits build up inside the cat meaning it doesn’t work as efficiently and, over time, this increases the harmful emissions coming out of the exhaust – one of the key elements tested in the MOT. On modern diesel-powered vehicles there is a particulate filter (DPF) in the exhaust system that does a similar job but removes and stores a greater number of particulates ahead of the cats. If you don’t know whether your diesel car has one fitted, telephone a franchised dealer and they will be able to tell you. It’s worth noting that if your car is relatively new and still under its manufacturer warranty, drivers should consult a franchised dealer before taking any remedial action themselves. The modern diesel engine is designed run a ‘regeneration cycle’ where it burns off the accumulated deposits, but if the DPF is excessively clogged this won’t happen and a garage will most likely suggest replacing the whole unit, which is very costly, with prices often over £1,000. Some experts suggest that problems with cats and DPFs are made worse by using low quality fuel, often from non-branded filling stations. Generally, both do-it-yourself and aftermarket cleaning products are additives consisting of varying chemicals that pass through the combustion process and then break down the harmful deposits in either the DPF or cat. These can then be passed through the system and expelled out of the exhaust. They are claimed to cause no damage to other parts of the engine. What do they cost and how do you use them? Let’s start with the cheaper, and therefore more popular, do-it-yourself cleaning products. 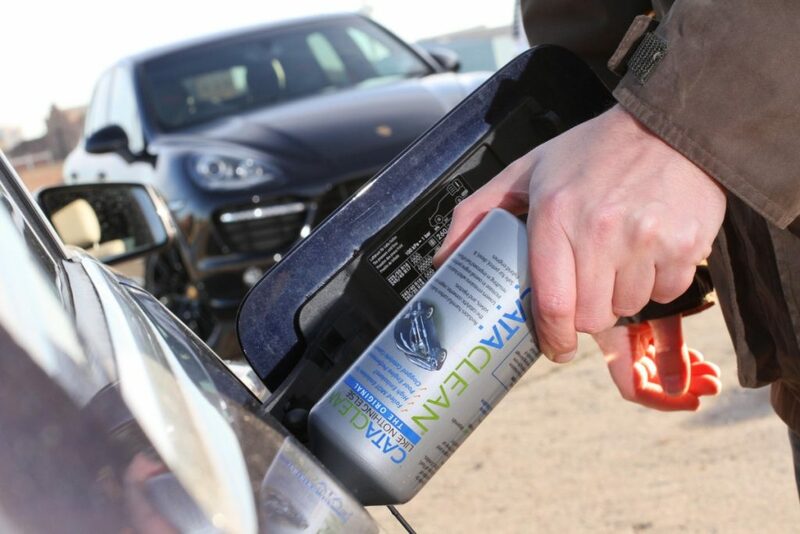 These compact bottles of fluid can be bought from reputable motor spares stores or online, and you simply pour the liquid into the car’s fuel tank, much like filling the car with fuel. Catalytic converter cleaning additives, such as Cataclean, are around £15-20, whereas the DPF cleaning additives such as Wynn’s DPF Cleaner is around £10 from Halfords. Cataclean also offers drivers a diesel version that cleans both the DPF and cat and costs around £20. All of these additives are used by simply pouring them into your fuel tank and driving the car in the usual way for 15-30 minutes. Most advise a specific ratio of fuel to additive on the bottle, so always read the instructions before using the product. Do garages clean exhaust systems? More and more garages offer an exhaust cleaning service. One option is called Terraclean which is a patented cleaning system that tackles everything from the fuel injectors right to the exhaust tip. It can only be administered by an approved garage, but there are over 450 across the UK. It costs between £110 and £130, depending on engine size. Halfords Autocentres offer a diesel particulate filter cleaning service, and charge £35 for a ‘maintenance clean’ and £85 for a ‘deep clean’. The company adds that in the unlikely event that either of the treatments fail to work, it will deduct the cost of the treatment from the servicing bill. Because every car’s mileage and operating life can be different, there are caveats surrounding after-market products. For example, they don’t offer a permanent fix with just one use. The makers of DIY additives for catalytic converters claim to have proven results in helping reduce harmful emissions by up to 60 per cent, but typically recommend using their product four times a year. The DPF filter cleaners don’t have great feedback however, mainly because if the car’s own regeneration process isn’t doing the job or performing correctly, the build-up of deposits will only continue. The Terraclean system is expensive but has excellent results, says Stuart Matthews of Carrevolution, a dealer based in Norfolk: “Any high mileage cars I sell get a Terraclean as it always improves driveability and emissions when they get an MOT”. Some experts say the best way to reduce problems with an exhaust system in the first place is by using good quality, branded fuel, and to undertake longer trips on main roads, keeping the engine revs between 2,000 and 3,000rpm for between 30 minutes to an hour. Using the cleaning products is all good. What about when the product damages injectors and high pressure fuel pumps. That’s one of the main problems with injectors going wrong. Hi Sam, What is the evidence for this? Do you have a good link for us? I just had a look mate go to google type. problems after fuel injector cleaning additive used. I’ve driven over 300,000 miles in various diesel cars and have never had a cat. or had my exhaust cleaned. The answer is the way the car is driven. Diesel engines are designed to run at constant moderate revs ideally 2500 to 4000 depending on the car. This keeps the cat at the right working temperature.Thrash it when you can to keep it clean and healthy! Your going to buy a diesel. Only buy one if you doing long juernys don’t buy it if your going to do 10 miles a day. So basically what everyone is saying is that diesel cars just aren’t fit for purpose for the average person’s daily uses , perhaps manufactures need to get there act together . I drive normally I live in the city and to drive hard every so often to clean my cars exhaust system I’d probably get nicked . I think a diesel for people who do short journeys shouldnt be a problem. I do feel a diesel does need a good thrash from time to time to clear the system. One quote I read was drive it like you have stolen it especially before the mot lol. I personaly never had any problem with diy adatives. Look after your car and it will look after you. Yes, I agree with the author’s beginning line that says there are two areas of car’s exhaust system- the catalytic converter and the diesel particulate filter, which need regular cleaning. Such issues could lead the vehicles to failing their MOT. So, you have to check your car in a reputable garage at regular interval. The professionals handle the problems effectively. You cannot ignore such repair at any cost as it deals with the emission coming out of the car’s exhaust system that can decide the safety of the environment. Hello, can anyone tell me if the “regeneration” process for dpf cleanout has to be done with the car moving, or can it be done at idle while keeping the revs up? Diana, the regeneration process must only be done with the car moving. For example, a good time to attempt this is when undertaking a long journey using main roads, so that the vehicle speed is sufficient that the engine will be in the optimum rev range. Hope that helps. Yes, I agree with you, James. I know a car’s exhaust system consists of a number of components. But the catalytic converter and the diesel particulate filter are two such parts present in the vehicle’s exhaust system that need frequent cleaning. But it is quite unfortunate to say that, the exhaust system hardly gets the intentness it deserves, especially when it comes to aftercare. I don’t know why many vehicle owners take it as a thankless part of their vehicle. Obviously, it should be regularly inspected like other components and serviced timely. Well, by using the above cleaning products, one can clean his automobile’s exhaust system. Wait! Before going to use these products, please make sure you are aware of its implementation. If not, then it will be better to take the help of a proficient car technician for the same purpose. Too many people do not fully understanding the workings of the Diesel Particulate Filter and the Catalytic converter with respect to a Diesel engine. 1. Diesel engines are Perfect for slow town use (EXCEPT if fitted with a DPF) Which due to the low exhaust temperature and low gas flow which produce excessive carbon particulate matter. Diesels are also perfectly matched to automatic transmissions due to their high torque curve at low engine revolutions. 3. When DPFs re-generate, they require certain criteria. High gas flow, High temperature. (normally associated with Motorway driving). There is more to this, Passive or Active re-gen ——– but not here and now. 4. When re-generating, the Carbon particulate matter burns BUT leaves Ash residue which over time WILL ultimately block the filter as “ash” does not burn at exhaust temperatures. 5. After market cleaners may help but a 95% clean will need “DPF” removal from the vehicle and a Chemical clean & Back flush as the internal honeycomb is designed to STOP particulate matter from passing through, including ash. 6. Finally, make sure the Differential Pressure Sensor is functioning correctly. 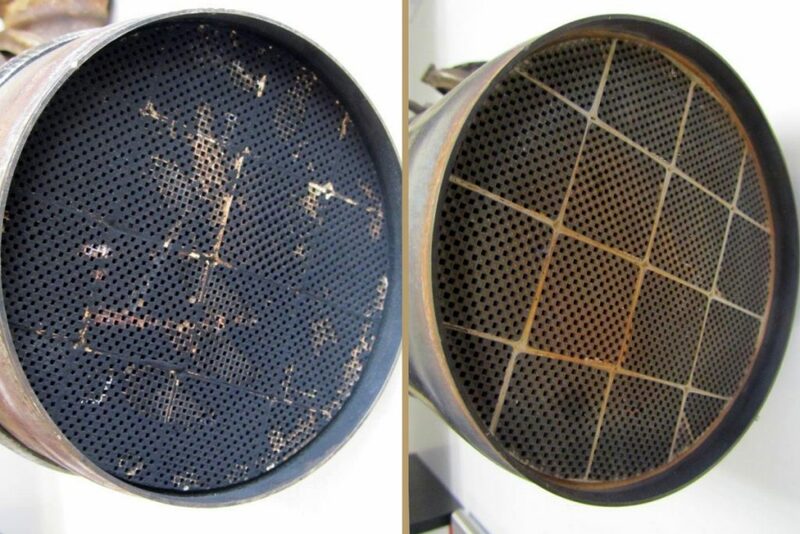 It is a common failure that can simulate a DPF that is clogged. So ends this first lesson. Failed 2008 (2007-08; pre-DEF) Ford F250 SD DPF-CAT. [9200h] I totally agree. My problem was due to not getting up to temp (high temps now only at 620*F) due to not enough road travel and oil getting into the exhaust (sabotage – another story). Replacement costs look to be $130-145 for the DiffP sensor, $40-60 for the O2 sensors and $600-800-1300(high priced) for the DPF [eBay]. I’m at stage 2 clogged (DTC readings) and the engine stays in limp mode, a situation that will make the situation only worse. The element has to come off at the very least and a certified mechanic will only replace the part. So it goes as to not having a heated garage and the time to try a soak and back flush. I will try to clean it out later this year using a urea + ammonia mix for the soak and a light power wash, but considering the time that this would take (2 hours of mechanic time vs 30 minutes), it seems that the potential savings may not be there in comparison to the cheap DPFs on eBay (considering a re-clog in 10000 miles). Removal of the emissions is not an option, as this truck is being used commercially at times (removal is illegal in any circumstance and for those that do remove such, keep the parts and clean them out for re-installation if you intend to sell the vehicle). I am going to run a tuner (Intune 2002) after fixing the problem.